Systainer and Foam Pac Insert Set for GRS-16 - TSO Products LLC. 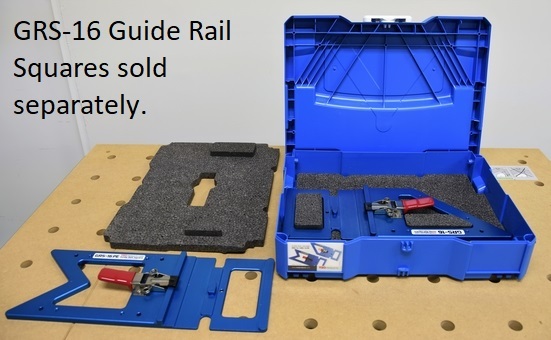 Introducing our own custom branded TSO Products Systainer with Foam Pac Inserts to conveniently store and transport your GRS-16 Guide Rail Squares. Systainers - Organization made easy. Festool SYSTAINERS offer a rugged, flexible, and convenient means of storing, carrying, and combining your GRS-16 Guide Rail Squares. Designed to seamlessly connect to one another and to Festool SORTAINERS and CT Dust Extractors, the SYSTAINER System makes it possible to configure highly mobile, job-specific kits, keeping you organized and working efficiently. Made of durable, robust, high quality ABS for long service-life. All SYSTAINERS share an identical footprint for easy stacking, storing, and transport. Centrally positioned, oversized handle makes it easy to carry heavy loads. TSO Products custom branded Systainers are molded in blue, have our logo on the lid lock, and also include a durable plastic full color identification card on the front. Quick video of how it all fits together. I had seen that there was this systainer with foam available for the grs-16 and grs-16 pe so I thought I would give it a try. It does the job. The fit is nice. I like it, but it might not be practical in a shop setting. For the jobsite I could see this being useful. If anything It gives the owner of the grs-16 or grs-16 pe a systainer that isn't Festool green and grey. I have been storing the GRS-16 under my MFT table since I bought it. Along with other odd-sized and odd-shaped items that always seem to get tangled. I thought that this would solve at least some of my problems and I was correct. I am able to store both my TRS-16 and my TRS-16PE in the Systainer with the foam inserts preventing them from being damaged. And now it stacke securely with my other systainers. Great organizational item.